Bender started as a citadel on the commercially important port of the river Dniestre, Genoese merchants settled there and later Jewish merchants. In 1806 it was conquered by the Russians and remained Russian until 1918 together with the rest of Bessarabia. In 1991 it became part of the internationally reconised borders of the Moldovan Republic. Image Above: Czar Nicolas II visits Bendery arriving at the Auditorium, the cultural focal centre of the town, where it is said Jewish people loved to walk up and down the street. 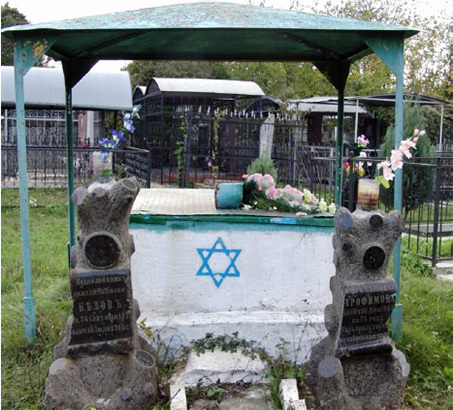 In the Jewish cemetry of Bendery there is an old tomb of Lieutenant Colonel Belov Nikolay, on it is a big star of David. We know that Jews were not allowed to hold army positions above Captain, it is clear therefore that L.Colonel Belov was a baptized Jew with a christian sounding name, his burial however indicates that although legally presumably a Christian in person he remained faithfull to his religion and Israel. The powerless and vulnerable Jewish community desperately needed support from authority figures, L.Colonel Belov apparently was one of them, his actions and Jewish identity had to remain secret, so we will find nothing about him in recorded Jewish histories, additionally, the rabbinical establishment, would not want to seem that convertion is a way to become a Jewish hero, and helped surpress the knowledge and memory of these heroes, the families of which often helped the Jewish community even generations later. We do not know if these 'fake' conversions of able Jews were orchestrated/encouraged by the community, but what we do know is that there were enough of them to elicity a law in 1912 prohibiting converted jews and the grandchildren of Jews from rising in rank and serving as military officers. This situation continued until the Russian Revolution, which allowed Jews As Officers but shortly afterwards banned Judaism & all religions. Memoirs Of The Russian Governor Of Bessarabia Following the pogroms a humanist and fair governor was sent to calm things down,a priceless insight into Russian governance and the People Instigating The Pogroms, A Travel In Time With Glimses of Bendery.